This game, Dates & Dots, can be played in several ways insha'Allaah. 1). Make two copies of the cards. Take the first set and tape them around the house with the dates showing. Give the child the second set of cards with the dots showing. Invite them to find the date cards that match the dot cards they have. 2). Make two sets of the cards. Play memory. Place the first set of cards with the dates showing and the second set of cards with the dots showing. Children have to find the dates that match the dots. 3). Or it can be a handmade variation of the Ladybug/Ladybird Game (which has many variations). There is a great version of the Ladybug Game here. 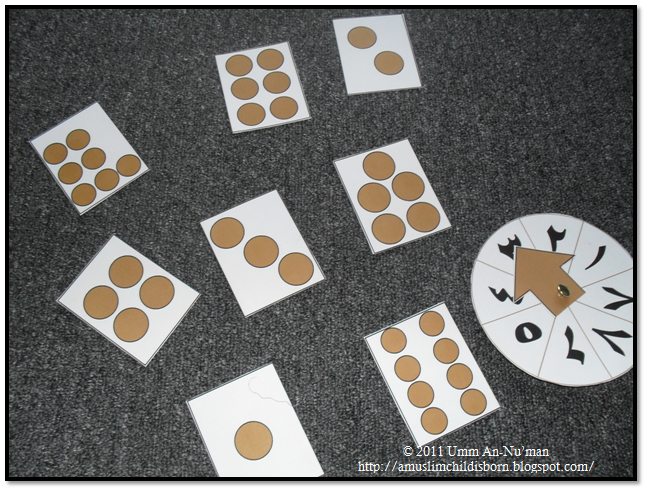 To play: Turn all of the cards down with the dots facing upward (for young children it may be a good idea to start with cards 1-3 first). Children take turns spinning the spinner (or you can put the number cards 1-10 in a box and children pick a number randomly). Whichever number they land on (or pick), they find the card with the corresponding dots. They turn the card over and count the dates on the opposite side of the card to confirm they picked the correct card. If they did, they keep the card. If they did not, they put the card back and the next person takes his/her turn insha'Allaah. There are cards in the file for numbers 1-10 but the spinner in the file goes to 8 only. ...What way would your children play Dates & Dots?